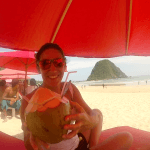 When and where is it a good time to have a Bintang during your vacations in Bali? The short answer is you can have a Bintang every time and everywhere! Well, maybe apart from your early morning session at 6 a.m. (for the ones that have taken surfing seriously and do make it to the lineup in the very early morning hours). But let’s start with the obvious. What is a Bintang? 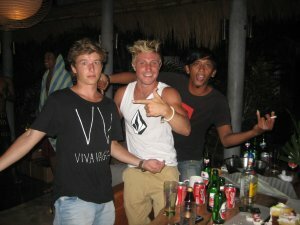 It is the most popular beer in Bali. They sell it everywhere: from the supermarket to the local warung (buffet style food – very popular and cheap here) to your favourite bar. The price varies from 20.000 IDR in a supermarket to 60.000 IDR in a fancy bar or restaurant. And I hate to disappoint you but Bali’s most popular beer is actually produced by Heineken. Yes, not that local as you might expect. 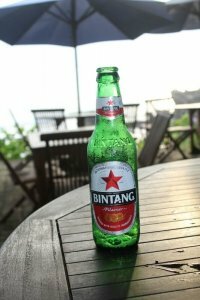 In fact the red star on the bottle of Bintang is the same as that of Heineken’s. Interestingly enough, Bintang is of quite good quality as in 2011, the beer won a gold medal for Lager at the Brewing Industry International Awards (BIIA 2011) in London. And now that you know what a Bintang is, try tasting one (if you haven’t done that already). Besides everybody around you is probably having one at least after sunset. And the funny thing is, that a lot of people do not actually like beer back home. But here, Bintang is just the cheapest and safest alternative for a drink. So when and where to have this Bintang? • After your morning surf at around 11 a.m., at a beach warung, starring at the ocean and feeling happy for yourself for just being in the water for one and a half to two hours or simply making it to the beach at f… 6 a.m.! • During your lunch/brunch at around 12.30 – 13.00 p.m. no matter where you decide to have it. 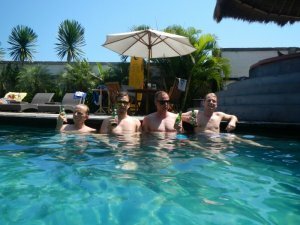 • But my favourite Bintang is after sunset surf, starring at the sunset (that is always amazing in Bali) and just calling it a day – as the night is still young! This in fact is the most well deserved Bintang of the day! • Also one too many Bintang(s) is always a good idea for a lazy night at your favourite local bar or for a crazy night out, let’s say in Kuta. And as the English say: an apple a day keeps the doctor away, in Bali we say: a Bintang a day keeps the blues away! Cheers!